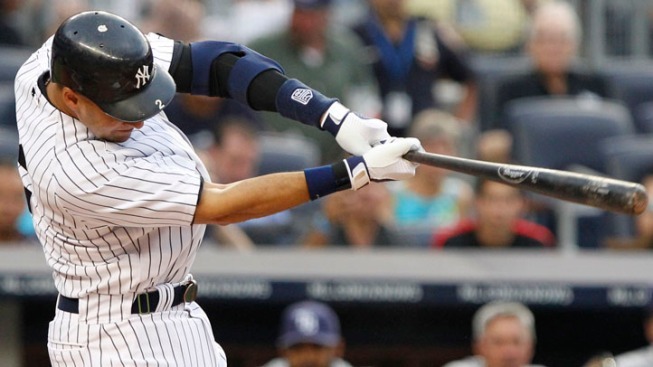 Derek Jeter follows through on a double during the first inning against the Rays. Jeff Niemann gave up Derek Jeter's 2,998th hit but little else, B.J. Upton homered and drove in three runs, and the Tampa Bay Rays beat the New York Yankees 5-1 on Thursday night to start strong in a long stretch of games against their biggest division rivals. Ben Zobrist homered, tripled and singled for Tampa Bay, which tagged Bartolo Colon early in one of the worst outings of his surprising comeback season. Evan Longoria had an RBI single and the Rays won the first of 11 straight games against New York and Boston, the two teams they trail in the AL East. With a chance to hit for the cycle in the ninth, Zobrist walked for the second time in the game. The leadoff man reached safely in all five plate appearances. Jeter is trying to become the 28th major leaguer — and first with the Yankees — to reach 3,000 hits, one of baseball's biggest milestones. He doubled on Niemann's first pitch, then grounded out his next four times up and ended the night two short. With two runners on, Jeter made the last out of the game on a bouncer to third against ex-Yankee Kyle Farnsworth. Rookie right-hander Jeremy Hellickson pitches for the Rays on Friday night. Niemann (4-4) went a season-high 7 1-3 innings, yielding only a solo homer by Robinson Cano in the sixth. The 6-foot-9, 260-pound righty gave up six hits and walked two, improving to 3-0 in four starts since missing six weeks with a strained lower back. Before going on the disabled list, he was 1-4 with a 5.74 ERA in six starts. Colon (6-4) entered 4-0 with a 1.00 ERA in his past four starts, but he ran into trouble right away in his second outing since coming off the disabled list (strained left hamstring). The 38-year-old right-hander allowed five runs and a season-high 10 hits in 5 2-3 innings, dropping to 9-3 in 19 starts against Tampa Bay. He also matched a season high with four walks. New York had won five straight home games and 11 of its last 13. Jeter, who came off the disabled list Monday in Cleveland, played his first home game since injuring his calf June 13, when he was six hits short of 3,000. Needing three to reach the plateau Thursday in the opener of a four-game series that takes the Yankees into the All-Star break, it appeared a few things were lined up in his favor. He began the night 5 for 9 (.556) in his career against Niemann, who allowed Jeter's 2,721st career hit on Sept. 9, 2009, which tied Lou Gehrig for the Yankees record. The captain had three hits that night off Niemann, and he got off to another rousing start in this one. With a host of friends and family members in attendance, including his parents, Jeter smacked the first pitch he saw into left-center for a double, bringing a roar from the sellout crowd of 47,787. Charged-up fans rose to their feet and cameras flashed for each subsequent at-bat, but Jeter couldn't come through again and finished 1 for 5. Zobrist tripled to start the game, a ball that glanced off the glove of first baseman Mark Teixeira before Nick Swisher had trouble corralling it in the right-field corner. Longoria's single put Tampa Bay on top against Colon, who had thrown 12 2-3 scoreless innings over his previous two starts. Zobrist led off the third with his 10th homer. Two outs later, Casey Kotchman doubled and scored on Upton's single. Kotchman singled to open the fifth and Upton lofted the next pitch into the seats in left for his 14th home run, making it 5-0. Cano hit his 15th homer in the sixth, but that was all the offense the Yankees could muster.